An estimated 81 percent of the permafrost that covers the Tibetan Plateau will possibly disappear by the year 2100 because of the warming climate, according to a Chinese scientific report cited by the Global Times on Wednesday. The permafrost is estimated to decrease by 39 percent in the near future, extrapolated from continually rising temperatures, according to the report issued by the Institute of Tibetan Plateau Research under Chinese Academy of Sciences, citing a model analysis result. The frozen earth has an utmost temperature that is rising at a rate of around 0.3 degrees Celsius per decade, according to the report. While a 1.1-degree rise of average temperature on the Tibetan Plateau will not have much impact on the permafrost, if the temperature rise increases to around 2.91 degrees, the majority of the permafrost will disappear, the report added. Human activities contribute to the shrinking of frozen soil. 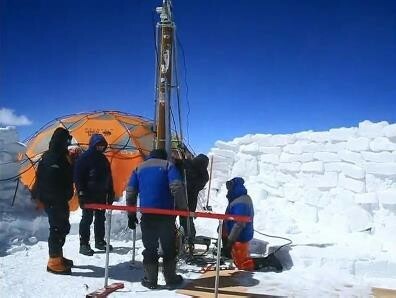 The activity of frozen earth layers can be monitored as deep as 4.57 meters along the Qinghai-Tibet railway that stretches across the plateau. The figure is up to 1.37 meters deeper than in those areas with no human influence, and is growing by as much as 7.5 centimeters a year. More than half of the Tibetan Plateau is covered in permafrost. There are large reserves of carbon dioxide trapped within the ice. The Tibetan Plateau has also displayed increasing desertification, especially around the Yangtze River's source region, where desert area has reached 33,200 square kilometers, around two-thirds of the total deserted land around all of China's headwaters. The land-surface environment of the Tibetan Plateau has also deteriorated, as evidenced by the contradiction of frozen earth and expanded desertification. However, soil erosion has been generally curbed following 40 years of treatment, the report said.